Disclaimer: This article is open for discussion. 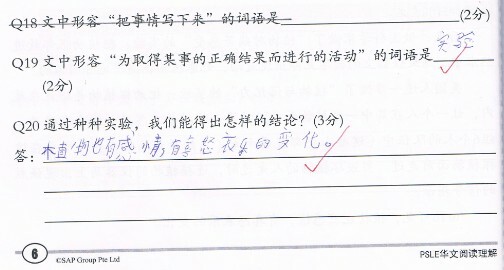 I do not own this reference book with the title PSLE 华文阅读理解 (PSLE Chinese Reading Comprehension)， 第一版 2012年. Some questionable examples are found in the book. 1. Answer that does not exist? The passage, please read carefully. Notice the deleted question 18. The answer that cannot be found in the passage. 2. Extra, missing or wrong words? Below are the three extracts from the book on different pages. After much discussion and consideration, it is confirmed that they are errors. Please feedback if you think otherwise. (a) Missing word of “生” as the correct noun should be “小学生”. (c) The original word is “卖”, which has been amended to “买”. 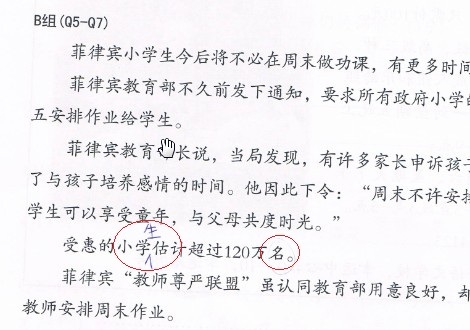 From the context of the passage, the passage is about consumers who has bought (买) the goods and found that the goods are not suitable for use. With these examples, I hope parents and students will be careful when referring to any reference books available in the market. If you have any doubt, always find a third opinion. Most importantly, have confidence in yourself, do not feel discouraged if you find questionable information in any reference book. Knowledge is gained through questioning. By Wendy in Languages on 25/07/2013 .